A very smart, clean two page CV template that would ideally be suited to a finance, business or analyst type role. Making use of the Open Sans font family, this CV has a fresh, spacious layout and stylish centred headings. 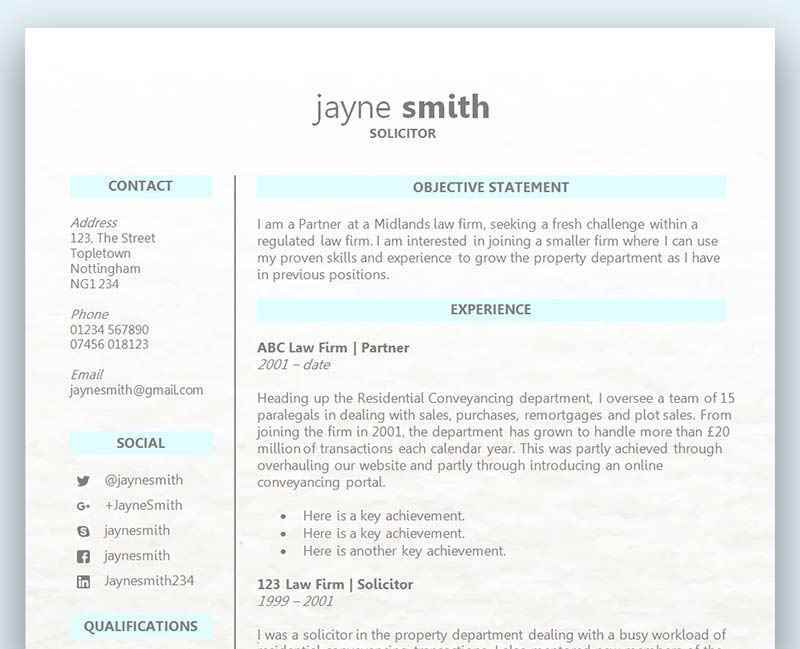 The graphics add a subtle but individual touch that helps to get this CV template noticed. Free Accountancy-themed CV template in Microsoft Word format	Overall rating:	4.5	out of 5 based on 2	reviews. A fresh clean design that was created for accountancy roles but could just as easily be used for any type of job application, with some minor tweaking. Download and install the Open Sans font family before you start editing - and take care to ensure that the header is centred after you have replaced the dummy text with your own name. CV advice: what does a spelling mistake on my CV say to an employer? When the hiring manager reads your CV they are not just looking to tick as many boxes as possible from the list of skills and qualifications they requested, they are also trying to paint a picture of how you’ll function as part of a team and how you’ll fit into the company’s culture. Are you a diligent person, hard working, passionate, dedicated, friendly, positive…? So what does a teeny tiny spelling mistake have to do with all this, and what will a spelling mistake on my CV say to a potential employer? You’d be surprised to know that a spelling mistake, no matter how trivial it may seem, could give the employer the impression that you’re lazy. A hard working employer is a mandatory requirement of any business, and if you’re not able to ensure your CV is completely free of errors you could project a lazy attitude and approach in your work. An employer wants to see a certain level of diligence in an employee so they can easily spot mistakes and rectify them. Having a good level of diligence allows an employee to highlight potential issues so they can be solved quickly and efficiently. A spelling mistake on your CV will clearly identify that your level of diligence is lacking, as you were unable to pick it up and solve the problem before you applied for the job. This sloppy approach could instantly mean rejection when it comes to trying to get an interview. If the job means that much to you then your CV would be free of errors – spelling, grammatical, formatting, and anything else that could end in rejection. The employer is looking for someone who is passionate and dedicated to getting it right the first time, and for an individual that wants to work for the company. An important aspect of most jobs is to have good literacy skills, which is why a spelling mistake could instantly put you at a disadvantage over other applicants. If you are applying for a clerical position then a spelling mistake on your CV will not look good at all. Even if you’re applying for a position that you’d expect not to have to put pen to paper, you’d be surprised to find that at some point you still have to. In any case, all of the previous reasons we’ve mentioned so far would come into effect, so even if you don’t need to have a degree in English you could make a bad impression with the employer. A CV free of spelling mistakes can put you one step closer to victory, and shows the employer that you’ve taken the time and effort to proofread your CV and ensure it’s perfect. After all, if you do really care that much for the job you would have spotted it!